Sequoia Capital has recently provided $4 million in Series A round of funding to Tokbox – a new startup providing real-time video chat via a browser. Sequoia joins an already impressive collection of angel investors including founding members of YouTube, Bebo, and Netscape along with execs from Slide, PayPal and Cisco. This investor network alone will likely propel the startup to partnerships and acquisition discussions. The same backers who helped catapult YouTube to glory wants to do for live video chats what YouTube did for video watching. 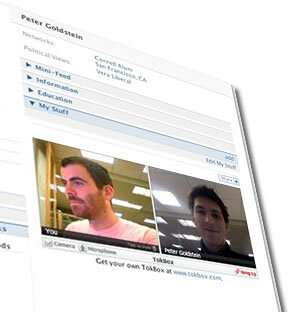 The company, TokBox, allows people with Webcams and broadband Internet connections to conduct face-to-face chats inside a Web browser. Users can visit its site, www.tokbox.com, or add a TokBox module to their pages on social Web sites like MySpace or Facebook. Several other services, including AOL’s AIM, Yahoo Messenger and Skype, allow live video chats but require that each party download the software and be online at the same time. On TokBox, if one party is not present, users can send a video mail message of up to five minutes in length that the other party can later retrieve at the site. “Video communication has never really taken off, despite the fact that people talk about it as a part of the future,” said Serge Faguet, TokBox chief executive, who is a 21-year-old native of Russia and co-founded the company after attending one semester of Stanford business school. The six-month-old (by that time – Oct ’07) TokBox would probably be just another dot-com with ambitious dreams were it not for an impressive pedigree that includes many of the same names as YouTube. Jawed Karim, a YouTube co-founder who left the video sharing site early on, is backing the company financially and sits on its board. Under no doubt some of the people engaged with the company do know one or more things about the online video market, but it is also pretty clear that if TookBox takes off and gets to be popular it is going to face scale up challenges. As YouTube’s popularity skyrocketed, it had to keep up with the bulging cost of storing and playing all those videos. TokBox will have to do that as well, and will also have to ensure that live video chats flow seamlessly. However TokBox has attracted high-profile talented technical advisers to help it overcome those obstacles. Rajeev Motwani, a Stanford professor and an early adviser to Google, is an investor and is counseling the company. Tony Bates, a senior vice president at Cisco, is also an investor and is helping TokBox to develop the underlying technology to support a large number of users. The company has also a Facebook application that was developed by Ryan Merket and allows you to video chat with your friends or leave video mail and voice mail for your friends directly from your own Facebook profile. Investors include: Sequoia Capital, Rajeev Motwani, Roelof Botha, Tony Bates and Jawed Karim, presumingly some of the individuals are angel investors. The company is based in Palo Alto and what is interesting as fact is the company is housed in the same offices that was used by YouTube to start off. Competitors include Skype, WebEx, Zorap and Userplane, among others. Of course, the company did not yet figure out what to make money from but this is not uncommon for most of the start ups in the Silicon Valley. The founders say they are looking at advertising and selling advanced versions of the service to companies that can use it to communicate with their customers online.